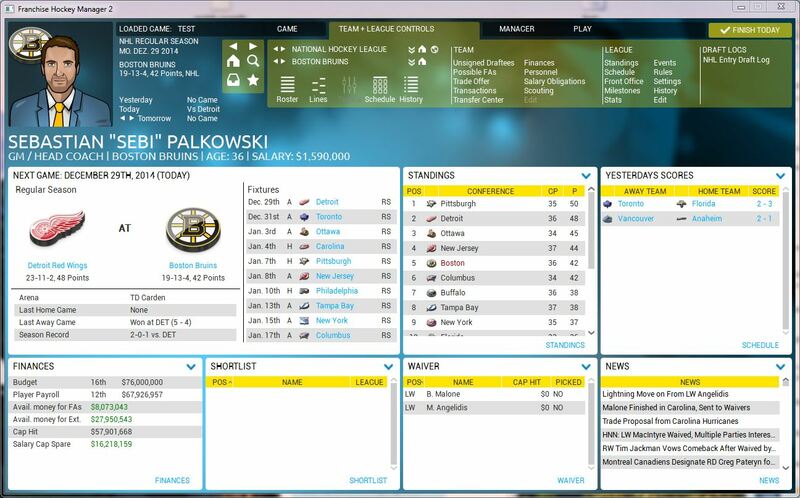 As per Brad Cook, of OOTP Developments summarizing the development progress of Sebastian Palkowski. Over the past several months, we copied and pasted every forum post about FHM 2014’s GUI into a file and reviewed it. 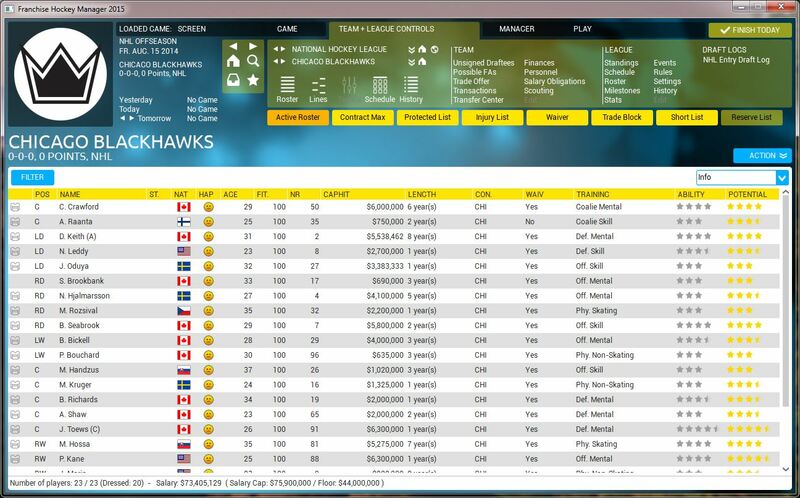 We took every comment to heart and reworked the new game’s GUI based on the “flat” look used by OOTP 15. Our goal was a shinier game with less crowded screens. We’re happy with the work done so far, but we will continue to improve some of the screens, particularly the lines and tactics screens. We didn’t just want the GUI to look better — We wanted the game to be easier to navigate too. With that in mind, we rebuilt the navigation from the ground up, resulting in a larger upper area that doesn’t lose much space because we removed many of the rows of buttons, except the “Action” button and the buttons belonging to tables. The menus that you had to click to open have been replaced by a ribbon-style menu that always has the most important buttons, such as Team and League, available at all times. We put Team and League in one menu that’s open most of the time, so you can reach nearly all the important screens with just one click. 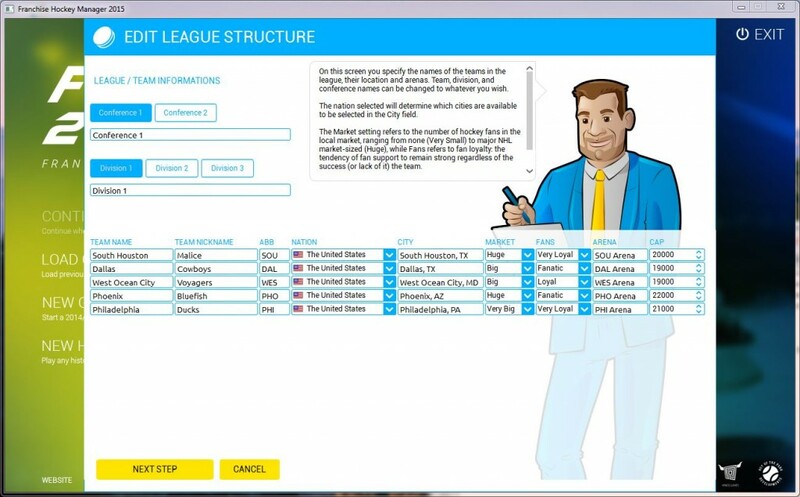 With the drop downs always available, it’s very easy to change teams and leagues. We also added small arrows that allow you to quickly go through all the teams or leagues in a specific country. 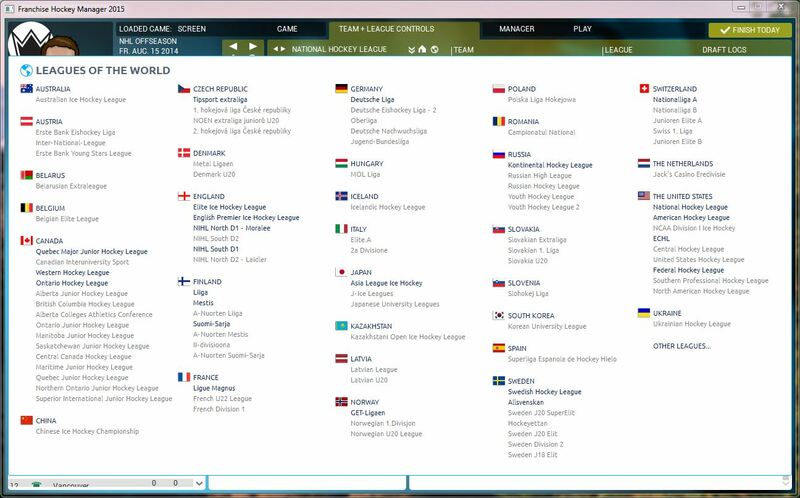 The leagues in the selected country are the only ones shown, so the League menu is less crowded. A new World menu lists all the available leagues, as shown in the screenshot below. One News screen replaces the three previous ones, and it’s always available through the ribbon menu. A new Bookmark menu that’s also always available in the ribbon menu lets you bookmark screens, like in OOTP. You can access the first 11 bookmarks with the F2-F12 keys. When playing on a higher resolution, the white space in the tables, which was covered by the Name column in 2014, is now covered by all available columns. You’ll no longer have the Name column covering half your screen. We tried to make as many items clickable as we could, so the navigation is even easier to use. The History area was redesigned with an eye toward easy navigation. 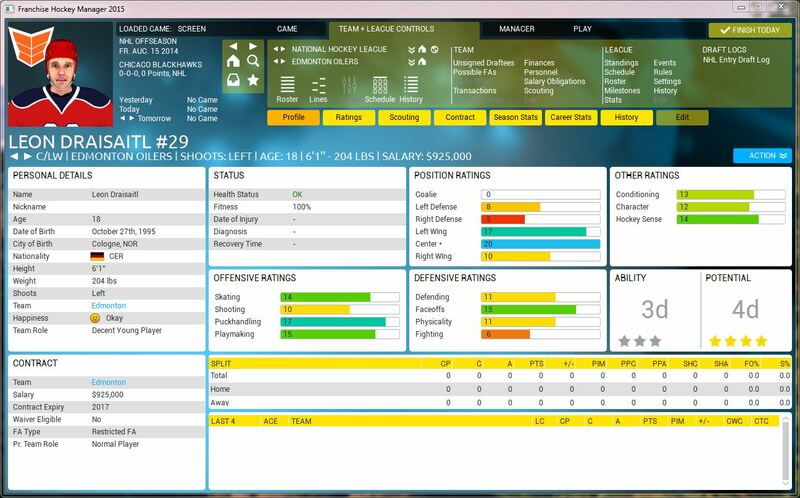 For example, you can now click on the draft information in a player page and go straight to that year’s draft list. A later Road to Release article will get into the History area in more detail. A future Road to Release article will also get into more detail about FaceGen, which, as we said, is still a work in progress. Fictional leagues in 2014 never felt quite right. 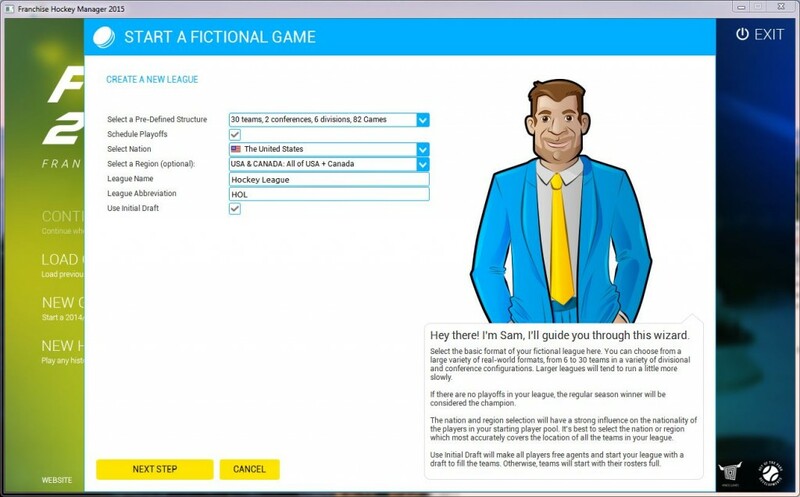 On one hand, FHM didn’t offer as many options as OOTP does, but on the other hand, there were enough options available that fictional leagues could be prone to crashes. We quickly discovered that the number of possible option combinations was large enough that we couldn’t anticipate all of them. So for 2015, we went back to the drawing board and redesigned the fictional mode from the ground up. We aimed for two goals: making it fun to play and keeping it as stable as possible. We looked at feedback on the forum and thought about what we’d like to see in a fictional hockey league. 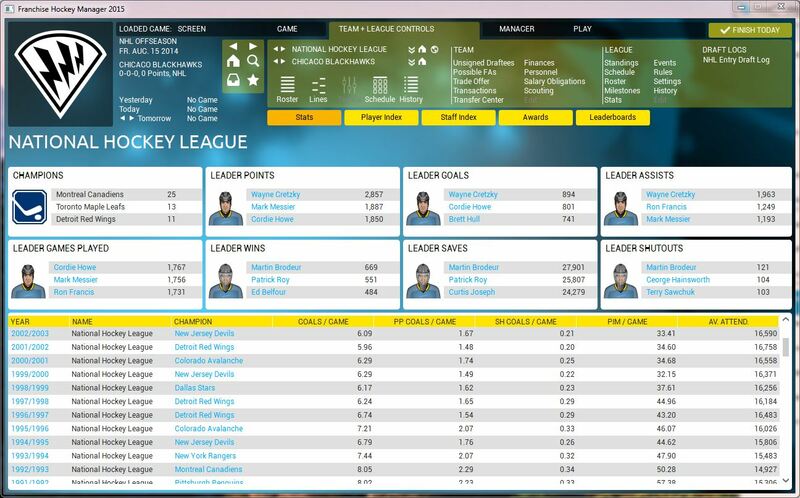 We decided that we wanted to let you create a small world to play in, since real life hockey is so complicated that we can’t give you numerous options for each aspect of an actual league (again with those pesky stability problems). With that in mind, we created a fictional mode that is centered around one default major league. If that’s all you want, great: You should be able to quickly run through the wizard and get started. 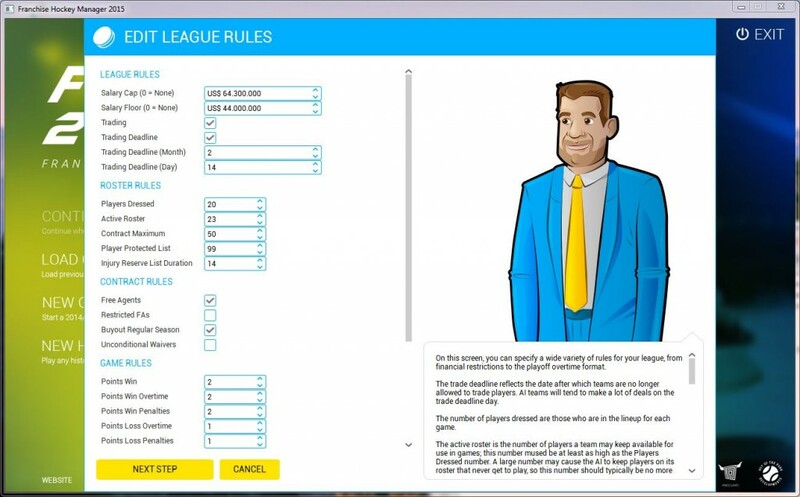 The default league features an annual draft class with fresh fictional players, and every team has a reserve list, or you can set up a minor league to replace the reserve lists. 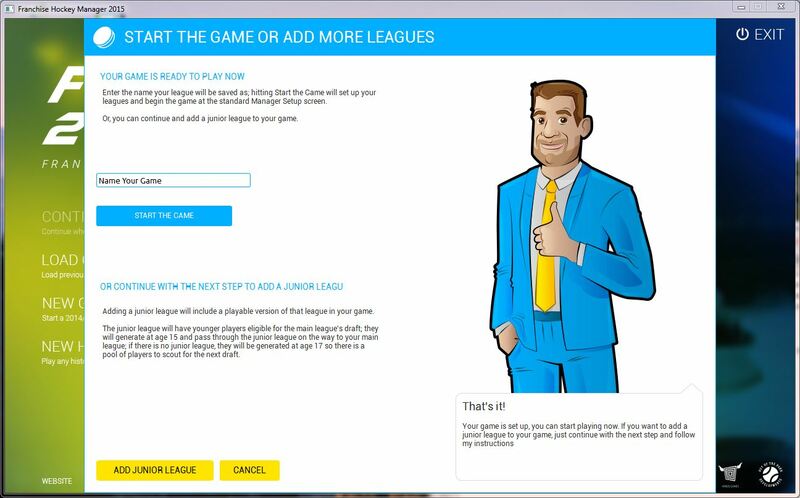 You can also add a major junior league level, in which case those teams draft players and then the major league teams select from them later in an entry draft. If this isn’t the kind of fictional mode you were hoping for, please understand that it’s more important for us to deliver a rock solid game than to cram in a lot of options that only a small percentage of our customers want. If we can expand fictional mode in a later version of FHM, we will, but for now, we want to keep it simple.